Your day-by-day itinerary now includes Spanish Steps, St. Peter's Basilica, Vatican Necropolis, and other attractions you added. For photos, maps, ratings, and other tourist information, read Rome trip planner . If you are flying in from Brazil, the closest major airports are Leonardo da Vinci–Fiumicino Airport and Ciampino–G. B. Pastine International Airport. In July, daily temperatures in Rome can reach 37°C, while at night they dip to 24°C. On the 21st (Sun), you'll have the morning to explore before heading off to Naples. Get some cultural insight at Cattedrale di Palermo and Tempio di Segesta. Get some historical perspective at Duomo di Monreale and Norman Palace and Palatine Chapel. Venture out of the city with trips to Riserva Naturale Orientata dello Zingaro (in Castellammare del Golfo) and Museo dell'Acciuga (in Aspra). There's still lots to do: explore the different monuments and memorials at Catacombe dei Cappuccini and don't miss a visit to Quattro Canti. To find traveler tips, where to stay, more things to do, and tourist information, you can read our Palermo route tool . You can fly from Rome to Palermo in 4 hours. Alternatively, you can do a combination of flight and bus; or do a combination of car and ferry. Finish your sightseeing early on the 24th (Wed) so you can travel to San Teodoro. Get in touch with nature at Cala Mariolu and La Cinta. Do some cultural sightseeing at Castello della Fava and Museo archeologico di Olbia. Change things up with these side-trips from San Teodoro: Spiaggia Berchida (in Siniscola), Cala Goloritzè (in Baunei) and Oasi Biderosa (in Orosei). There's still lots to do: kick back and relax at Lu Impostu Beach and stroll through Cala Brandinchi. For where to stay, maps, and other tourist information, read San Teodoro driving holiday website . Getting from Palermo to San Teodoro by flight takes about 4.5 hours. Other options: do a combination of bus and flight; or do a combination of ferry and car. July in San Teodoro sees daily highs of 37°C and lows of 22°C at night. Finish your sightseeing early on the 28th (Sun) so you can travel to Florence. Kick off your visit on the 28th (Sun): explore the world behind art at Uffizi Galleries, get a new perspective on things with Boat Tours & Water Sports, examine the collection at Academy Of Florence Art Gallery, get engrossed in the history at Basilica di Santa Croce, then get to know the fascinating history of Piazza del Duomo, and finally take in the spiritual surroundings of Cathedral of Santa Maria del Fiore. On the next day, admire the striking features of The Baptistery of St. John, kick back and relax at Lido Di Camaiore, then admire the masterpieces at Pitti Palace, then take some stellar pictures from Piazzale Michelangelo, and finally take in the exciting artwork at Aria Art Gallery. Planning Florence trip won't be overwheling when you use's Insprock itinerary maker. Do a combination of flight and train from San Teodoro to Florence in 5 hours. Alternatively, you can fly; or do a combination of ferry and car. July in Florence sees daily highs of 35°C and lows of 21°C at night. Finish your sightseeing early on the 30th (Tue) to allow enough time to travel to Munich. Kick off your visit on the 30th (Tue): contemplate the long history of Schloss Nymphenburg, see the interesting displays at BMW Welt, and then stroll around English Garden. Get ready for a full day of sightseeing on the next day: get curious at Deutsches Museum, then examine the collection at Munich Residenz, then explore the world behind art at Alte Pinakothek, and finally admire the striking features of St. Peter's Church. For more things to do, ratings, where to stay, and more tourist information, refer to the Munich sightseeing planning site . Getting from Florence to Munich by flight takes about 4.5 hours. Other options: do a combination of train and flight; or drive. Traveling from Florence in July, things will get slightly colder in Munich: highs are around 29°C and lows about 15°C. 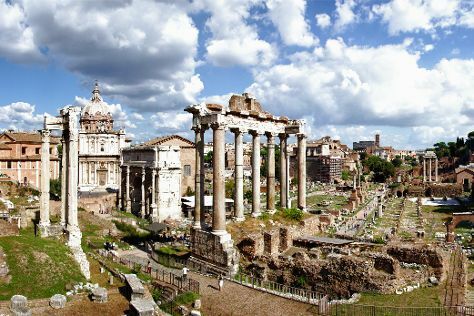 Cap off your sightseeing on the 1st (Thu) early enough to travel to Rome. On the 1st (Thu), don't miss a visit to Sistine Chapel. To see where to stay, photos, other places to visit, and other tourist information, refer to the Rome trip maker . Traveling by flight from Munich to Rome takes 5 hours. Alternatively, you can do a combination of train and flight; or drive. Expect somewhat warmer temperatures when traveling from Munich in August; daily highs in Rome reach 38°C and lows reach 24°C. On the 2nd (Fri), you'll travel back home.